I told you I’d eventually dust off the first 20 pages or so of my notebook back in the welcome post. I wasn’t intending to do so this quickly. But I was reminded of this drink recently so I’m jumping the gun a little bit. This is one of the few recipes in that first 20 pages that I’m actually proud of. Few people under the age of 40 know what a Grape Nehi is. And few people over 40 associate it with anything but the “Radar” O’Reilly character on M*A*S*H. Radar was a naive farm boy serving in the Korean war in the 1970’s TV series. While the other characters were blowing off steam in the officer’s club by drinking martinis and highballs, Radar always ordered a Grape Nehi. Grape Nehi is an early 20th century soda flavor that is still on sale through limited distribution. The Nehi Soda Company eventually became RC Cola, but early on (1920’s) had many fruit soda flavors including grape. The name is pronounced “knee-high” and the logo of the old soda company was a pair of stockinged legs, so it was a great double-entendre for M*A*S*H to subtly drop, like the leg lamp in A Christmas Story. 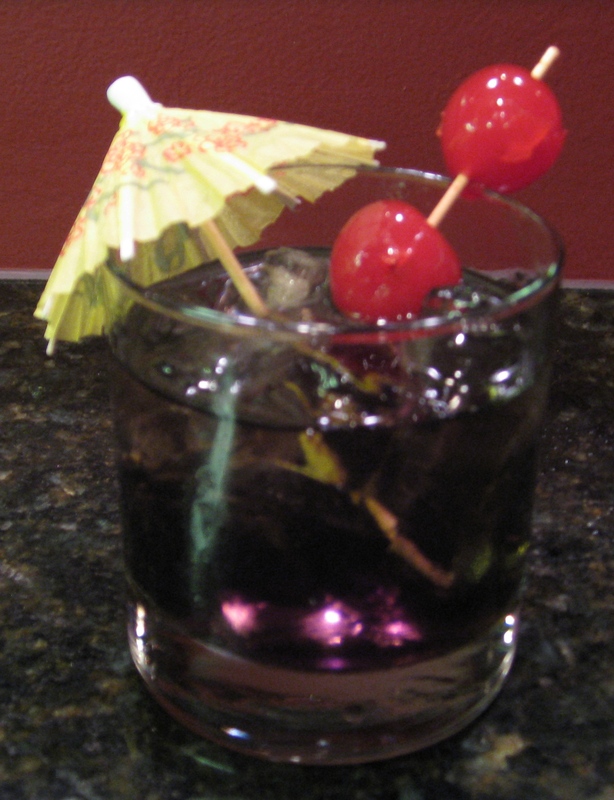 Post-M*A*S*H, many people developed elaborate Grape Nehi cocktail recipes. Most today are complicated ‘faux martinis’ along the lines of a Cosmopolitan that include Chambord and other expensive (and seldom-used) ingredients. The more basic version of an ‘adult’ Grape Nehi, though, was always a simple highball with vodka and grape soda. And this is the drink that I’m writing about today. Or at least a variation of it. I read once that making good cocktails with vodka is like making great meals with the best Kobe beef. The drinks might be quite good. But pulling these off does not exactly require your best chops. So much better would be the great cocktail using rum or bourbon. More important than the challenge, I found years ago that this drink is much better if you use cuban-style rum (Bacardi) rather than vodka anyway. The sugarcane origin of rum makes it just a little bit sweeter, and it blends more naturally with the sweetness of the grape soda. This does two things: It makes for a more cohesive drink period, and it allows you to use a higher ratio of rum to soda without making the drink too ‘hot’. So in my recipe, rum is the liquor of choice. The second question to ask yourself when assembling this drink is “which soda do I use?” This is an important question, and the dialog in the grocery store could easy look like this. Likewise, the sugarcane-based premium sodas mix better with rum than do the corn-syrup-based mainstream sodas. The problem here is that they’re not always easy to find. My rule: If the grocery store I’m at has Boylan’s or IBC (or Henry Weinhard’s on the west coast — my absolute favorite grape soda) then spend the extra money without reservation. But if I have to put out an Amber Alert for it, I don’t hesitate to buy the 12-pack of Crush. A side note on any carbonated mixer. I don’t care if it is ginger ale or tonic water or club soda, I NEVER buy the 2-liter bottle. Even marginally flat soda can have a big effect on your highballs, so buy a six-pack of the smaller bottles and open more of them. It always tastes better and the additional cost is minimal. Lastly, the garnish. It is a simple drink, so a simple garnish like a lime wedge or a cherry would match the recipe. But if you wanted to have a little fun with it (and I do), serve it like a sarcastic tropical drink and put an umbrella in it. Wait, one last note. This recipe works with premium orange sodas, creme sodas, and black cherry sodas as well. I don’t like any of these as much as I do grape, and if you don’t have a premium, sugarcane-based soda of another flavor please dont’ use Orange Crush. It just isn’t the same. I don’t care how many people make a “Root Beer Float” with Vanilla Stoli and premium Root Beer…well, okay. I like that one too. Just don’t tell anyone. This entry was posted in Uncategorized and tagged Grape Nehi, Rum. Bookmark the permalink. I’m assuming this calls for a “silver” or light rum as opposed to a “gold” rum or some other variant. It does — good catch. With Rum, Cuban=Silver=Light (all really equals Bacardi in most cases). This post reminds me of being a kid with all of the soda flavors…sans the alcohol of course 🙂 I love orange and grape soda! Combine over rocks in highball glass. We made very large thigh-highs while tailgating prior to the Stanford – UW football debacle in Palo Alto. They were a big hit, and the right color. I may have a new favorite drink name. Vodka and grape juice in a highball called ‘Communion’. Haven’t tried it but I’m sure its heavenly.